Definition at line 263 of file llinventorybridge.h. Definition at line 299 of file llinventorybridge.h. Definition at line 1813 of file llinventorybridge.cpp. References LLInventoryModel::addObserver(), LLAssetType::AT_CALLINGCARD, LLAssetType::AT_GESTURE, LLAssetType::AT_LOST_AND_FOUND, LLAssetType::AT_OBJECT, LLAssetType::AT_TRASH, checkFolderForContentsOfType(), LLRightClickInventoryFetchDescendentsObserver::done(), FALSE, LLInventoryFetchDescendentsObserver::fetchDescendents(), LLInventoryModel::findCategoryUUIDForType(), LLInventoryModel::getCategory(), LLInvFVBridge::getClipboardEntries(), LLInventoryPanel::getModel(), LLInventoryObject::getUUID(), gInventory, hideContextEntries(), inc_busy_count(), LLInvFVBridge::isAgentInventory(), LLInventoryFetchDescendentsObserver::isEverythingComplete(), isItemRemovable(), LLInventoryModel::isObjectDescendentOf(), lldebugs, llendl, mCallingCards, mDisabledItems, LLInvFVBridge::mInventoryPanel, mItems, mMenu, LLInvFVBridge::mUUID, mWearables, sSelf, and TRUE. Definition at line 1800 of file llinventorybridge.cpp. References LLInventoryModel::collectDescendentsIf(), LLDynamicArray< Type, BlockSize >::count(), LLInventoryModel::EXCLUDE_TRASH, FALSE, LLInvFVBridge::mUUID, and TRUE. Referenced by buildContextMenu(), and folderOptionsMenu(). Definition at line 1990 of file llinventorybridge.cpp. References LLAssetType::AT_NONE, LLInventoryModel::createNewCategory(), LLInventoryPanel::getModel(), LLInvFVBridge::getUUID(), LLInvFVBridge::mInventoryPanel, LLInventoryModel::notifyObservers(), NULL, LLInventoryPanel::setSelection(), and TAKE_FOCUS_YES. Definition at line 2068 of file llinventorybridge.cpp. Definition at line 2038 of file llinventorybridge.cpp. Definition at line 2063 of file llinventorybridge.cpp. Definition at line 2028 of file llinventorybridge.cpp. 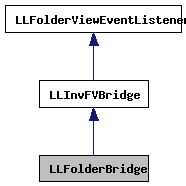 Definition at line 2013 of file llinventorybridge.cpp. Definition at line 2053 of file llinventorybridge.cpp. Definition at line 2008 of file llinventorybridge.cpp. Definition at line 2018 of file llinventorybridge.cpp. Definition at line 2058 of file llinventorybridge.cpp. Definition at line 2033 of file llinventorybridge.cpp. Definition at line 2023 of file llinventorybridge.cpp. Definition at line 2048 of file llinventorybridge.cpp. Definition at line 2043 of file llinventorybridge.cpp. Definition at line 2084 of file llinventorybridge.cpp. References create_inventory_item(), LLWearableList::createNewWearable(), gAgent, LLWearable::getAssetType(), LLWearable::getDescription(), LLAgent::getID(), LLPermissions::getMaskNextOwner(), LLWearable::getName(), LLWearable::getPermissions(), LLAgent::getSessionID(), LLWearable::getTransactionID(), LLWearable::getType(), gWearableList, LLInventoryType::IT_WEARABLE, and NULL. Definition at line 2074 of file llinventorybridge.cpp. Referenced by createNewEyes(), createNewGloves(), createNewHair(), createNewJacket(), createNewPants(), createNewShape(), createNewShirt(), createNewShoes(), createNewSkin(), createNewSkirt(), createNewSocks(), createNewUnderpants(), createNewUndershirt(), and do_create(). Definition at line 1078 of file llinventorybridge.cpp. References LLAssetType::AT_BODYPART, LLAssetType::AT_CLOTHING, LLAssetType::AT_GESTURE, LLAssetType::AT_NONE, LLAssetType::AT_OBJECT, LLAssetType::AT_TRASH, LLInvFVBridge::changeCategoryParent(), LLInventoryModel::collectDescendents(), LLDynamicArray< Type, BlockSize >::count(), LLGestureManager::deactivateGesture(), FALSE, LLInventoryModel::findCategoryUUIDForType(), gAgent, LLAgent::getAvatarObject(), LLInventoryModel::getCategory(), LLInventoryPanel::getModel(), LLInventoryObject::getParentUUID(), LLInventoryCategory::getPreferredType(), LLToolDragAndDrop::getSource(), LLInventoryObject::getUUID(), gGestureManager, gInventory, gToolDragAndDrop, i, LLInvFVBridge::isAgentInventory(), LLGestureManager::isGestureActive(), LLInventoryModel::isObjectDescendentOf(), LLVOAvatar::isWearingAttachment(), LLAgent::isWearingItem(), LLInvFVBridge::mInventoryPanel, move_inv_category_world_to_agent(), LLInvFVBridge::mUUID, NULL, S32, LLToolDragAndDrop::SOURCE_AGENT, and LLToolDragAndDrop::SOURCE_WORLD. Definition at line 2145 of file llinventorybridge.cpp. References LLAssetType::AT_BODYPART, LLAssetType::AT_CATEGORY, LLAssetType::AT_CLOTHING, LLAssetType::AT_GESTURE, LLAssetType::AT_NONE, LLAssetType::AT_OBJECT, LLAssetType::AT_ROOT_CATEGORY, LLAssetType::AT_TRASH, LLInvFVBridge::changeItemParent(), copy_inventory_from_notecard(), copy_inventory_item(), LLGestureManager::deactivateGesture(), FALSE, LLInventoryModel::findCategoryUUIDForType(), LLViewerObjectList::findObject(), gAgent, LLInventoryView::getActiveInventory(), LLAgent::getAvatarObject(), LLAgent::getGroupID(), LLAgent::getID(), LLInventoryPanel::getModel(), LLToolDragAndDrop::getObjectID(), LLPermissions::getOwner(), LLInventoryView::getPanel(), LLInventoryObject::getParentUUID(), LLInventoryItem::getPermissions(), LLToolDragAndDrop::getSource(), LLToolDragAndDrop::getSourceID(), LLInventoryObject::getType(), LLInventoryObject::getUUID(), gGestureManager, gObjectList, gToolDragAndDrop, LLInvFVBridge::isAgentInventory(), LLViewerInventoryItem::isComplete(), LLGestureManager::isGestureActive(), LLInventoryModel::isObjectDescendentOf(), LLVOAvatar::isWearingAttachment(), LLAgent::isWearingItem(), llendl, llinfos, llwarns, LLMoveInv::mCallback, LLInvFVBridge::mInventoryPanel, LLMoveInv::mMoveList, LLMoveInv::mObjectID, move_task_inventory_callback(), LLMoveInv::mUserData, LLInvFVBridge::mUUID, NULL, LLViewerObject::permYouOwner(), LLToolDragAndDrop::SOURCE_AGENT, LLToolDragAndDrop::SOURCE_LIBRARY, LLToolDragAndDrop::SOURCE_NOTECARD, LLToolDragAndDrop::SOURCE_WORLD, TRUE, LLInventoryPanel::unSelectAll(), and warn_move_inventory(). Definition at line 1939 of file llinventorybridge.cpp. References DAD_ANIMATION, DAD_BODYPART, DAD_CALLINGCARD, DAD_CATEGORY, DAD_CLOTHING, DAD_GESTURE, DAD_LANDMARK, DAD_NOTECARD, DAD_OBJECT, DAD_SCRIPT, DAD_SOUND, DAD_TEXTURE, dragCategoryIntoFolder(), dragItemIntoFolder(), and FALSE. Definition at line 1758 of file llinventorybridge.cpp. References LLAssetType::AT_CALLINGCARD, LLAssetType::AT_GESTURE, LLAssetType::AT_NONE, LLAssetType::AT_OBJECT, checkFolderForContentsOfType(), LLInventoryModel::getCategory(), LLInventoryPanel::getModel(), LLInventoryCategory::getPreferredType(), hideContextEntries(), mCallingCards, LLInvFVBridge::mInventoryPanel, mItems, mMenu, LLInvFVBridge::mUUID, and mWearables. Definition at line 1971 of file llinventorybridge.cpp. References LLInventoryModel::getCategory(), LLInventoryPanel::getModel(), LLInvFVBridge::mInventoryPanel, LLInvFVBridge::mUUID, and NULL. Referenced by getIcon(), LLBeginIMSession::handleEvent(), isItemRenameable(), modifyOutfit(), performAction(), removeItem(), renameItem(), and restoreItem(). Definition at line 1591 of file llinventorybridge.cpp. References LLAssetType::AT_ANIMATION, LLAssetType::AT_BODYPART, LLAssetType::AT_CALLINGCARD, LLAssetType::AT_CATEGORY, LLAssetType::AT_CLOTHING, LLAssetType::AT_GESTURE, LLAssetType::AT_LANDMARK, LLAssetType::AT_LOST_AND_FOUND, LLAssetType::AT_LSL_TEXT, LLAssetType::AT_NONE, LLAssetType::AT_NOTECARD, LLAssetType::AT_OBJECT, LLAssetType::AT_SCRIPT, LLAssetType::AT_SNAPSHOT_CATEGORY, LLAssetType::AT_SOUND, LLAssetType::AT_TEXTURE, LLAssetType::AT_TRASH, getCategory(), LLViewerImageList::getImage(), LLInventoryCategory::getPreferredType(), LLControlGroup::getString(), gImageList, gViewerArt, MIPMAP_FALSE, NULL, and TRUE. Definition at line 1930 of file llinventorybridge.cpp. References LLInventoryModel::categoryHasChildren(), LLInventoryModel::CHILDREN_NO, FALSE, LLInventoryPanel::getModel(), gInventory, LLInvFVBridge::mInventoryPanel, and LLInvFVBridge::mUUID. Definition at line 1716 of file llinventorybridge.cpp. References FALSE, LLInventoryClipboard::instance(), LLInvFVBridge::isAgentInventory(), and TRUE. Definition at line 981 of file llinventorybridge.cpp. References LLAssetType::AT_NONE, FALSE, and LLInvFVBridge::getInventoryObject(). Definition at line 997 of file llinventorybridge.cpp. References LLAssetType::AT_BODYPART, LLAssetType::AT_CLOTHING, LLAssetType::AT_NONE, LLAssetType::AT_OBJECT, LLInventoryModel::collectDescendents(), LLDynamicArray< Type, BlockSize >::count(), FALSE, gAgent, LLAgent::getAvatarObject(), LLInventoryModel::getCategory(), LLAgent::getInventoryRootID(), LLInventoryPanel::getModel(), LLInventoryCategory::getPreferredType(), gInventory, i, LLInventoryModel::isObjectDescendentOf(), LLVOAvatar::isWearingAttachment(), LLAgent::isWearingItem(), LLInvFVBridge::mInventoryPanel, LLInvFVBridge::mUUID, S32, and TRUE. Referenced by buildContextMenu(), and removeItem(). Definition at line 1566 of file llinventorybridge.cpp. References LLAssetType::AT_NONE, FALSE, gAgent, getCategory(), LLAgent::getID(), LLViewerInventoryCategory::getOwnerID(), LLInventoryCategory::getPreferredType(), and TRUE. Definition at line 1065 of file llinventorybridge.cpp. References FALSE, LLInventoryModel::getCategory(), LLInventoryPanel::getModel(), LLViewerInventoryCategory::getVersion(), LLInvFVBridge::mInventoryPanel, LLInvFVBridge::mUUID, and LLViewerInventoryCategory::VERSION_UNKNOWN. Definition at line 2096 of file llinventorybridge.cpp. References getCategory(), LLInventoryPanel::getModel(), LLInvFVBridge::mInventoryPanel, and wear_inventory_category_on_avatar(). Definition at line 1558 of file llinventorybridge.cpp. References LLInventoryModel::fetchDescendentsOf(), LLInventoryPanel::getModel(), lldebugs, llendl, LLInvFVBridge::mInventoryPanel, and LLInvFVBridge::mUUID. Definition at line 1984 of file llinventorybridge.cpp. Definition at line 1725 of file llinventorybridge.cpp. References copy_inventory_item(), LLDynamicArray< Type, BlockSize >::count(), count, gAgent, LLDynamicArray< Type, BlockSize >::get(), LLAgent::getID(), LLInventoryModel::getItem(), LLInventoryPanel::getModel(), i, LLInventoryClipboard::instance(), isClipboardPasteable(), LLInvFVBridge::mInventoryPanel, LLInvFVBridge::mUUID, NULL, LLInventoryClipboard::retrieve(), and S32. Definition at line 1506 of file llinventorybridge.cpp. References LLInventoryModel::deleteObject(), FALSE, getCategory(), LLInventoryPanel::getModel(), LLInventoryModel::getObject(), LLInvFVBridge::mInventoryPanel, modifyOutfit(), LLInvFVBridge::mUUID, LLInventoryModel::notifyObservers(), openItem(), pasteFromClipboard(), LLInventoryModel::purgeDescendentsOf(), remove_inventory_category_from_avatar(), LLInventoryObject::removeFromServer(), restoreItem(), LLInvFVBridge::showProperties(), and TRUE. Definition at line 1675 of file llinventorybridge.cpp. References LLAssetType::AT_GESTURE, LLAssetType::AT_TRASH, LLInvFVBridge::changeCategoryParent(), LLInventoryModel::collectDescendents(), LLDynamicArray< Type, BlockSize >::count(), LLGestureManager::deactivateGesture(), FALSE, LLInventoryModel::findCategoryUUIDForType(), getCategory(), LLInventoryPanel::getModel(), gGestureManager, gInventory, LLPreview::hide(), i, LLGestureManager::isGestureActive(), isItemRemovable(), LLInvFVBridge::mInventoryPanel, LLInvFVBridge::mUUID, S32, and TRUE. Definition at line 1656 of file llinventorybridge.cpp. References FALSE, getCategory(), LLInventoryPanel::getModel(), LLInventoryObject::getName(), isItemRenameable(), LLInvFVBridge::mInventoryPanel, LLInventoryModel::notifyObservers(), and LLInventoryModel::updateCategory(). Definition at line 1577 of file llinventorybridge.cpp. References LLInvFVBridge::changeCategoryParent(), FALSE, LLInventoryModel::findCategoryUUIDForType(), getCategory(), LLInventoryPanel::getModel(), LLInventoryObject::getType(), and LLInvFVBridge::mInventoryPanel. Definition at line 991 of file llinventorybridge.cpp. Definition at line 1752 of file llinventorybridge.cpp. Definition at line 265 of file llinventorybridge.h. Definition at line 328 of file llinventorybridge.h. Definition at line 332 of file llinventorybridge.h. Definition at line 331 of file llinventorybridge.h. Definition at line 330 of file llinventorybridge.h. Definition at line 329 of file llinventorybridge.h. Definition at line 324 of file llinventorybridge.h. Referenced by buildContextMenu(), LLDoCreate::handleEvent(), and staticFolderOptionsMenu().